In June of 2018, Amazon announced the general availability of their Elastic Container Service for Kubernetes. Given that at Anchore we deliver our products as Docker container images, it came as no surprise to us that our users and customers would begin deploying our software on EKS. Since Kubernetes, Kubernetes on AWS, and Anchore on EKS adoption have all increased, I thought it best to give EKS a shot. For the scope of learning purposes, I thought I’d test out creating a EKS cluster, and launching a simple application. If you aren’t completely familiar with Kubernetes I highly recommend checking out the tutorials section of the website just so some of the concepts and verbiage I use make a little more sense. I also recommend reading about kubectl which is the command line interface for running actions against Kubernetes clusters. There are a couple of ways to create an EKS cluster, with the console or with the AWS CLI. 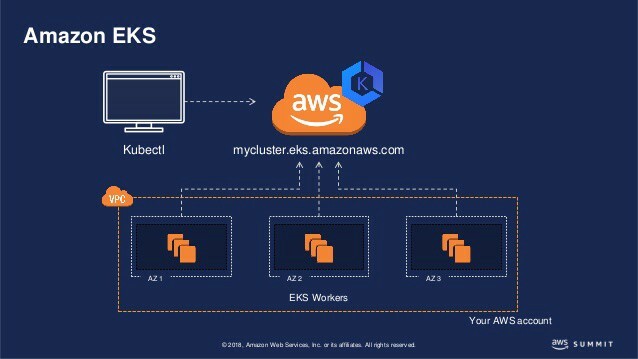 To begin, navigate here: https://us-east-2.console.aws.amazon.com/eks/home#/clusters and select create cluster. There are several pieces of information you’ll need to provide AWS for it to create your cluster successfully. Here I will need to select the IAM role that will allow Amazon EKS and the Kubernetes control plane to manage AWS resources on my behalf. If you have not already, you should create an EKS service role in the IAM console. Select a VPC and choose the subnets in the selected VPC where the worker nodes will run. If you have not created a VPC, you will need to create one in the VPC console, and create subnets as well. AWS has a great tutorial on VPC and Subnet creation here. Note: Subnets specified must be in at least two different availability zones. Here I choose security groups to apply to network interfaces that are created in my subnets to allow the EKS control plane to communicate with worker nodes. Once all the necessary requirements have been fulfilled, I can create the cluster. I would simply update --role-arn, subnetIds, and securityGroupIds into the above command. Next I can use the AWS CLI update-kubeconfig command to create or update my kubeconfig for my cluster. I created and launched worker nodes via the AWS CloudFormation console. It is important to note that Amazon EKS worker nodes are just standard Amazon EC2 instances. To create the stack, I simply selected create stack and added this Amazon S3 template URL: https://amazon-eks.s3-us-west-2.amazonaws.com/cloudformation/2019-02-11/amazon-eks-nodegroup.yaml, then I just filled out the parameters on the following screens. Next, I need to enable the worker nodes to join the cluster. I will do so by downloading and editing the AWS authenticator configuration map. Note: The ARN of instance role is the NodeInstanceRole value you can see in the output of the creation of your CloudFormation stack. In Kubernetes, a LoadBalancer service is a service that points to external load balancers that are not in you Kubernetes clusters. In the case of AWS, and this blog, an external load balancer (ELB) will be created automatically when I create a LoadBalancer service. Then I simply create the service. To verify, I can describe my service. Now I just quickly walked through a simple application deployment on EKS. As you’ve probably gathered, the most challenging part is all the setup. When you are ready to start deploying more complex containerized applications on EKS you now have all the steps needed to get a cluster set up quickly. At Anchore, I’m always excited to work with our users and customers leveraging Amazon EKS to run Anchore. To find out more about how Anchore can be deployed, I highly recommend checking out our helm chart and reading more about Helm on EKS. There is certainly a learning curve to Amazon EKS that requires a bit of knowledge on several different Amazon services in order to manage Kubernetes clusters effectively. By far the longest piece of this was getting the cluster set up. Any AWS-heavy users should be thrilled about the ability to make running containerized workloads in Kubernetes easy and cost-effective on the most popular cloud provider. With AWS still reigning as the top public cloud provider, it is only fitting Amazon created a service to adhere to the tremendous amount of container and Kubernetes adoption over the past two years.